Named in honour of the racecourse’s founding monarch, Royal Ascot’s Queen Anne Enclosure is the epicentre of the action - a vibrant world of colour, stylish fashion and incredible millinery just a whisker away from the world’s finest horses. Those with Queen Anne Enclosure admission enjoy uncompromised views, beautifully manicured lawns and atmospheric raised terraces to watch both the Royal Procession and the racing. With stylish Fine Dining restaurants, on-the-go food options, a Dress Code befitting a formal occasion and traditional communal singing around the Bandstand after the last race, the Queen Anne Enclosure, without doubt, provides a memorable Royal Ascot experience. Unwind in this stunning garden-style deck with outstanding elevated views of the closing furlongs as the world’s best horses bid for glory. Elevate the experience in the Queen Anne Enclosure by dining in one of our many restaurants. From lunch menus designed by renowned chefs to luxurious Afternoon Teas, many of our restaurants do not require pre-booking and welcome customers on the day. A suite of private gazebos and garden is the ideal upgrade experience for corporate groups or private parties of up to 50 guests. 1768 Grill & Tea Rooms overlook beautiful views of the Queen Anne Lawns, choose from a range of afternoon teas, designed by Master Pâtissier Eric Lanlard exclusively for Royal Ascot 2019. All include an indulgent selection of sandwiches, scones, handmade cakes and strawberry preserve. Also serving a lunch menu from £30 person. Picnics are available to order in advance and collect on arrival during Royal Ascot. Picnics are available to order online now. Guests can arrive from London Waterloo via train or by air via our private helicopter service. Not as formal as in the Royal Enclosure, yet the Dress Code here is followed with confidence. Ladies are required to wear a hat, and Gentlemen a matching suit and a tie. 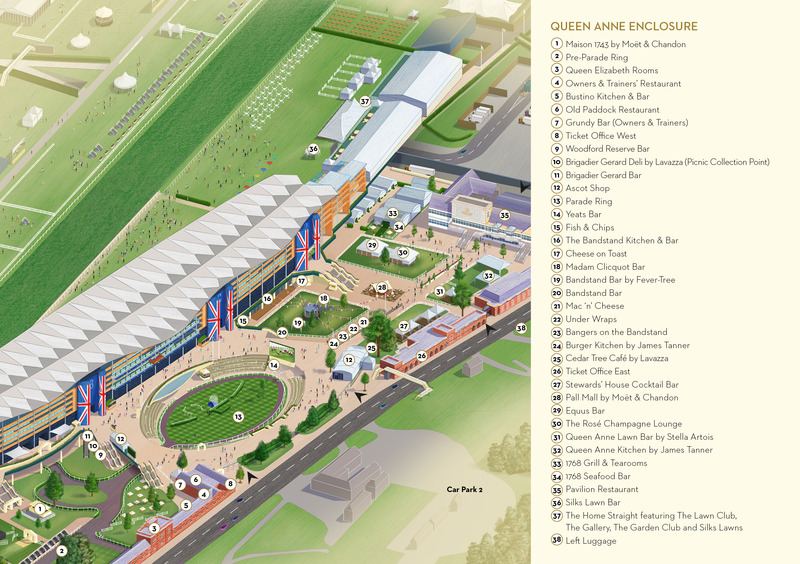 There is an impressive choice of bars throughout the Queen Anne Enclosure. Leisurely lunches, indulgent afternoon teas and innovative pop-ups, there are dishes to suit all tastes. A hidden gem, the unsaddling area is an evocative equine area. Admire the thoroughbreds in the Pre-Parade Ring before they are saddled up. Enjoy viewing around the Parade Ring where you can see the horses before each race and enjoy the celebrations of the winning connections. The Royal Procession has signalled the start of the Royal Meeting since 1825. The journey ends in the Parade Ring where you can watch HRH The Queen alight. As the clock strikes two, the Royal Landaus passes through the Golden Gates. Watch from the Grandstand terrace. Queen Anne Enclosure racegoers are invited to join the unforgettable tradition of singing around the Bandstand.